As spring finally begins to appear around the Great Lakes, volunteers are heading out to beaches for a spring cleaning. 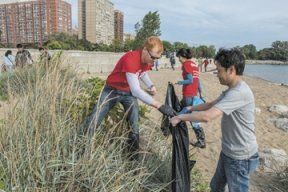 The Alliance for the Great Lakes’ Adopt-a-Beach program mobilizes thousands of volunteers who give back to their local beaches each year. April, especially Earth Day, marks the unofficial beginning of the beach season around the Great Lakes as many groups hold their first Adopt-a-Beach events of the year. Last year, 15,181 Adopt-a-Beach volunteers picked up 40,211 pounds of debris as part of 1,388 cleanups around the region. In addition to cleaning up beaches, volunteers collect valuable data. Data collected by Adopt-a-Beach volunteers gives insight into the most common and problematic types of litter. In 2016, the majority of trash picked up by Adopt-a-Beach volunteers (87%) was plastic. The three most common types of litter found in 2016 were tiny trash (made up of broken down pieces of plastic and glass), smoking-related litter, and food-related litter. Most litter found on Great Lakes beaches is anthropogenic, meaning it originated from human activity. Volunteers interested in participating in Adopt-a-Beach can find events in their community, or start their own cleanup, by visiting www.greatlakesadopt.org.